As video production has become almost completely digital oriented, the need for storage has increased exponentially. So much so that in 1991 the list of metric prefix multipliers(ie;milli, (m) and kilo (k) and mega (M)) has been extended to the power of +24 (septillion) and is growing to +48 in the near future. Will that even be enough? What does this mean to you? With digital media now the norm, the space required on your computer has become more than 10 million times larger. Fortunately storage has become much more attainable and affordable too. What this means is that even though you already have some storage at your facility, you will likely need to add more or transition to a newer storage platform to keep up with the demands of your projects. This does not necessarily mean abandoning your old storage just adding to or upgrading your current infrastructure. Storage can exist as direct attach devices(including portable) such as USB, Thunderbolt, SAS, or even Fibre connectivity. It can also mean shared pools of storage like SAN and NAS. Shared Storage Platforms are usually connected to multiple computers via ethernet or fibre optic cables. This helps cut down file transfer times by allowing more than one person to work with the same files at the same time. This removes the need to duplicate, copy or move files from one system to another. Vidcom represents several brands of storage platforms that will help you work more efficiently and effectively. We specialize in Shared storage solutions as well as direct attached and backup/archive tape solutions. We would be very happy to discuss your project needs to help you decide the best course of action for your company to take. Engineers bring wealth of knowledge, experience and expertise in implementing end to end 3D, 4K, 2K, High-definition or Standard Definition workflows. 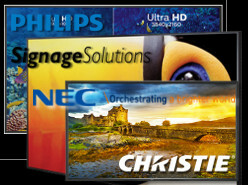 As a result VidCom has evolved a leader in Professional Video systems design and integration. VidCom fosters a culture of flexibility and adaptability which enables us to navigate through the rapidly changing products and market conditions inherent in the high tech industry. With a mantra of honesty, integrity and respect, VidCom has developed trusting, long-term partnerships with both Clients and Manufacturers. At our facility in Vancouver, we have dedicated space for Retail, Demonstration, System Integration, & a Lab, for testing new solutions. VidCom has a small warehouse where we stock significant inventory, this includes cameras, monitors, converters, batteries, chargers, storage drives, capture cards, tripods, lenses, LED lights, audio gear, streaming appliances & more. We support every product we sell.